Red Door by Elizabeth Arden is an oriental floral fragrance for women. The scent is a mix of no less than 23 floral and woody notes, with honey, rose, carnation, tuberose and sandalwood being the most prominent. Red Door has become the signature perfume of the brand and has been a best-seller ever since it first launched. The scent gets its name from the Elizabeth Arden's Red Door Spa Centres. Red Door was launched in 1989 and has since been launched in many different editions as well as gift sets. My absolute favourite, I have used this for years and continue to be complimented on how lovely I smell. Quite simply,the best for me! My wife is delighted, used this for years, will continue to buy - say no more!!!! This represents excellent value for my signature perfume! In the shops it’s at least twice the cost of perfume click. I would recommend that you consider buying your favourite perfume from them. Really quick dispatch too! I absolutely love Elizabeth Arden's Red Door and it has become my signature perfume! So many people comment on it and I feel good when I wear it. It is a good old classic and competes easily with many of the modern day perfumes! Three cheers for Red Door Original! Excellent value for my favourite perfume which I have been using for over 30 years! Bought this for my mum as it's one of her faves. Great size bottle for the price. Bought before and will defo buy again. This is my favourite perfume. I often receive compliments from friends and family on what a lovely fragrance it has. Having found a perfume that suits me I have been buying it for over 30 years. Bought this for my Mum as she used to have a bottle many years ago and the price was excellent and she was well chuffed. Many memory's in a scent. Elizabeth Arden Red Door Eau de Toilette 100ml Spray - New EditionA personal favourite for over 20 years! A personal favourite for over 20 years!Still love the fresh fragrance of Red Door .. great for everyday .. not over powering or over expensive .. always get compliments when I wear it. Recently purchased for my daughter as she always comments about 'that lovely Mum-smell"! This is the most beautiful perfume around. Only need a small amount and will last all day. Wherever I go people always ask which perfume I'm wearing. Also comes in a beautiful bottle. 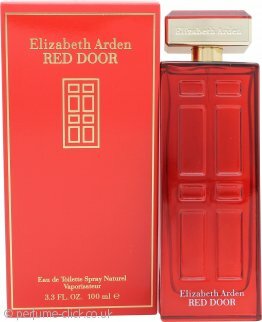 Elizabeth Arden Red Door Eau de Toilette 30ml Spray - New EditionElizabeth loves Red Door. I was standing behind a lady in a queue in M & S and told her she smelled nice. Several hours later I 'smelt' her again in a cinema queue and asked her the name of her perfume, it was clearly long lasting! Red Door, she said, google it! I did and made my purchace and I love it, light and pretty for every day and sophisticated enough for evening. Very smart packaging, slim bottle for packing when traveling. Excellent.